Since 1873, Khalil Mamoon has been turning heads with their beautifully crafted handmade hookahs. Now we get to enjoy those hookahs while we fill our bowl with their very own Khalil Mamoon Premium Flavored Tobacco as well. The cut is medium choppy and is a natural golden brown color as there are no dyes used. The packaging is very sleek and visually stunning. It comes in a nice golden tin and is double bagged to ensure its freshness. The design itself is very elegant and portrays a sort of sophistication that is not apparent in most - if not all - other brands. 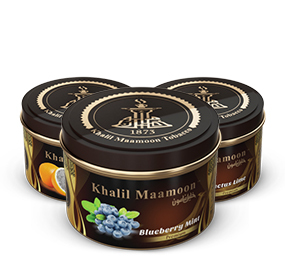 Khalil Mamoon has a nice variety to choose from and their 100 gram tins are perfect for allowing Hookah users to sample and experience an assortment of tobacco flavors at an affordable price. This size is packaged in individual gold cans with a secondary sealed packaging inside. This package is resealable but prone to rust so make sure to store it at room temperature in an airtight container so that it is sure to maintain its freshness. 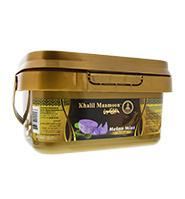 Khalil Mamoon is fairly juicy and produces the best results when using a fluff pack in a phunnel bowl. Always mix up your tobacco to redistribute the juices and then sprinkle it in producing a fluff pack. Just use your thumb and index to lightly drop in the tobacco up to the rim but not over. 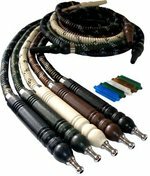 It is not very temperamental when it comes to heat so is recommended to start with 2-3 hookah coals depending on the size of the hookah bowl you are using and work your way up.